The Boxes on this page are kiln-cast glass combined with wood. They are all handmade using the lost wax process and each is unique. Hand cut fish marquetry in various natural wood veneers over walnut box, epoxied. Walnut base and top. Kiln-cast glass cat figure. Size: 5.25" wide, 4.25" deep, 6.5" tall including cat. This box is handmade and is one-of-a-kind. The wooden fish were made by cutting wood veneers by hand and piecing them together, then fixing them to a walnut base and epoxying over them to give the appearance of glass over an aquarium. All the colors of the woods used are entirely natural- no stains or dyes were used, and the fish are different on each of the four sides of the box, so this piece looks beautiful from every angle. The glass cat, dipping one curious glass paw over the edge toward the fish, was sculpted in wax before being cast in glass in our our kiln. No reusable molds were used or made in making it- it is entirely original. 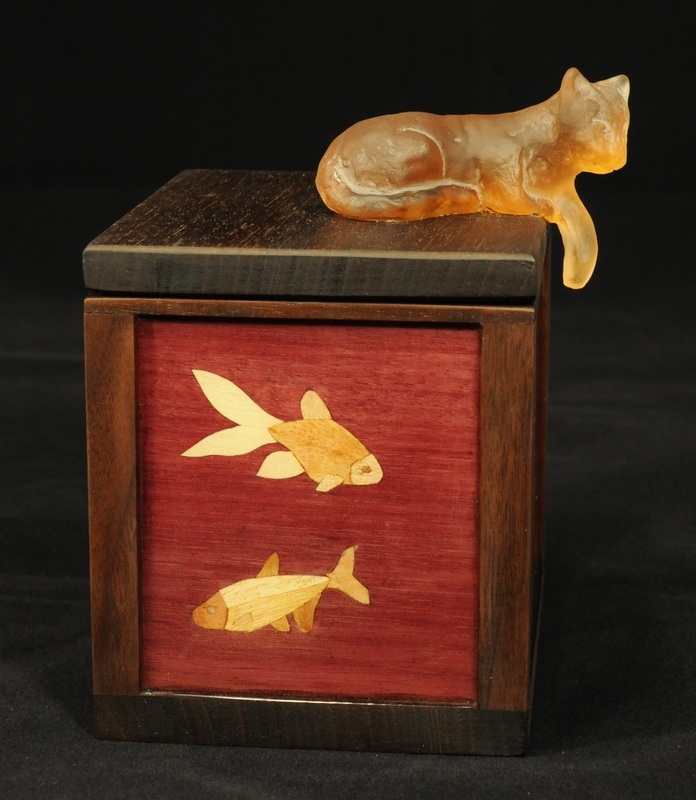 This is a unique and gorgeous sculptural box- a perfect item for any cat lover. Entirely handmade by us in our Austin, TX wood and glass studio. 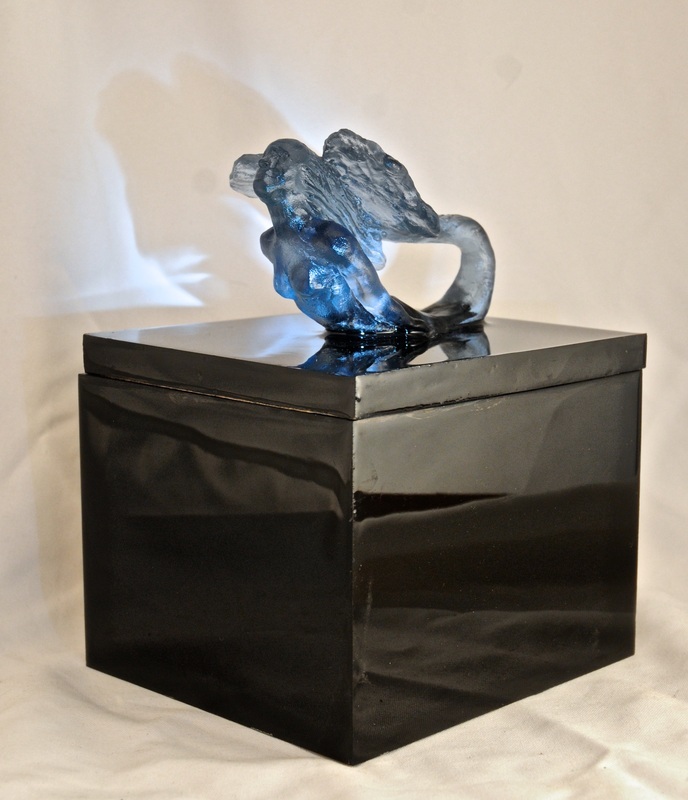 Original kiln-cast blue glass winged woman on mirrored rosewood box lined with blue suede. This box is handmade and is one-of-a-kind. No reusable molds were made or used in casting this figure, which was sculpted in wax before being cast in glass in our own kiln. The figure is made of a beautiful glowing blue glass, reflected in the mirror "water." The box is made of gorgeous streaky rosewood lined with soft royal blue suede- a perfect keepsake box which doubles as a sculpture. This box is beautiful from every angle. All handmade by us in our Austin, TX wood and glass studio. The figure is fragile and is not meant to serve as a lid lift, but as a decoration. It is recommended that you lift the lid by the wood, not by the glass. Bird's Eye Maple box with wenge legs and top. Kiln-cast pink glass octopus lid lift. Lined with ocean-patterned leather. Size: 5" wide by 4" deep by 6" tall, octopus is 2" tall so entire box is 8" tall. This box is handmade and is one-of-a-kind. The octopus was handmade using the lost wax method and was cast by us in our kiln using pink and orange glass. No molds were used or made in making this octopus- it is entirely original. It rests on a box of striking bird's eye maple wood of very fine figuring- it is a wood of a quality that is difficult to locate. The legs, base, and top are of dark wenge wood, and it is lined with a lovely wave-patterned leather. This is an entirely unique and sculptural piece. It looks beautiful from every angle, yet is a functional box. A great conversation piece, or a beautiful keepsake box. This was entirely handmade by us in our Austin, TX wood and glass studio. 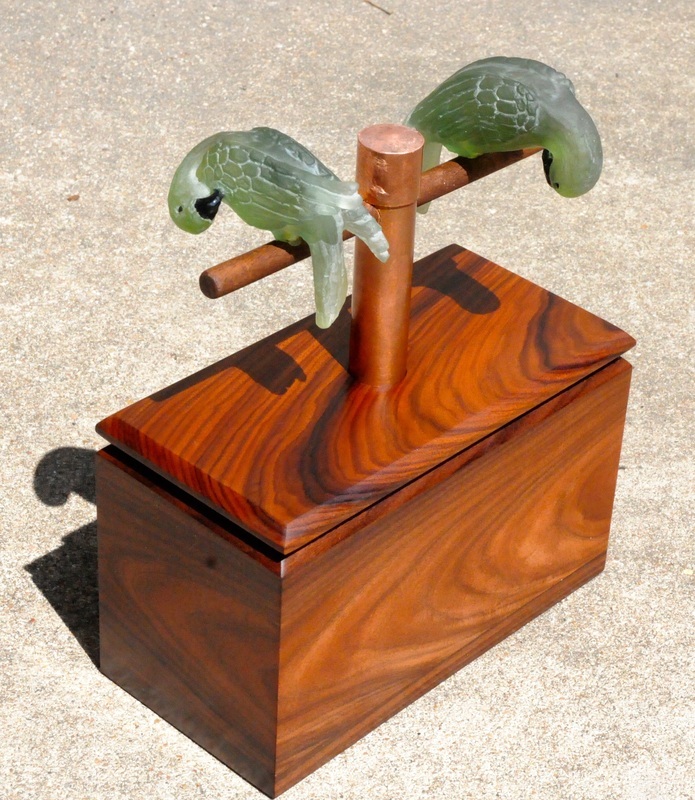 Rosewood Box with two cast glass parrots on copper and wood perch. Lined with green suede. Size: 8" long, 4" deep, 5" tall, parrots rise 5" above box, so the piece is 10" tall. This box is handmade and is one-of-a-kind. Each of the two glass parrots was hand-sculpted in wax before being cast in green glass. No molds were used or made for these figures- each parrot is entirely original, and each is different in its preening pose. Each parrot was sandblasted and their beaks and eyes painted black. They sit on a perch made of copper and wood, which is fixed on the top of a box made of gorgeous streaky rosewood with a beautiful grain and a luminous shine. The bottom of the box is lined with top-quality soft dark green suede. This is a breathtaking and totally unique sculptural piece that doubles as a functional box. It looks beautiful from all angles, but especially with light on the birds, and is sure to please parrot lovers! Entirely handmade by us in our Austin, TX wood and glass studio. Cast glass shell (using pate de verre and lost wax techniques) on curly maple box. Leather lining. This box is handmade and is one-of-a-kind. The shell was cast from real shell using the lost wax technique, and was kiln-cast using the pate de verre technique (powdered glass fired in a kiln) and was sealed with lacquer for a shiny effect. The box is a stunning curly maple with lovely curvy legs, and it is lined with leather in a print reminiscent of waves on the ocean. 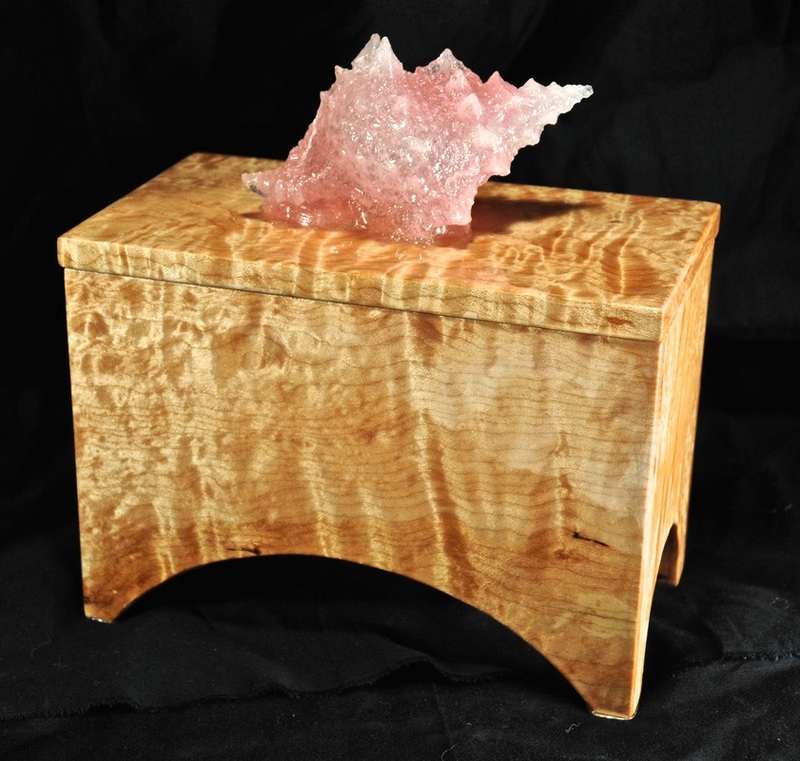 This is a stunning piece of glass and wood sculpture that looks beautiful from every angle, and which is also a functional box. A perfect piece for anyne who loves the ocean. 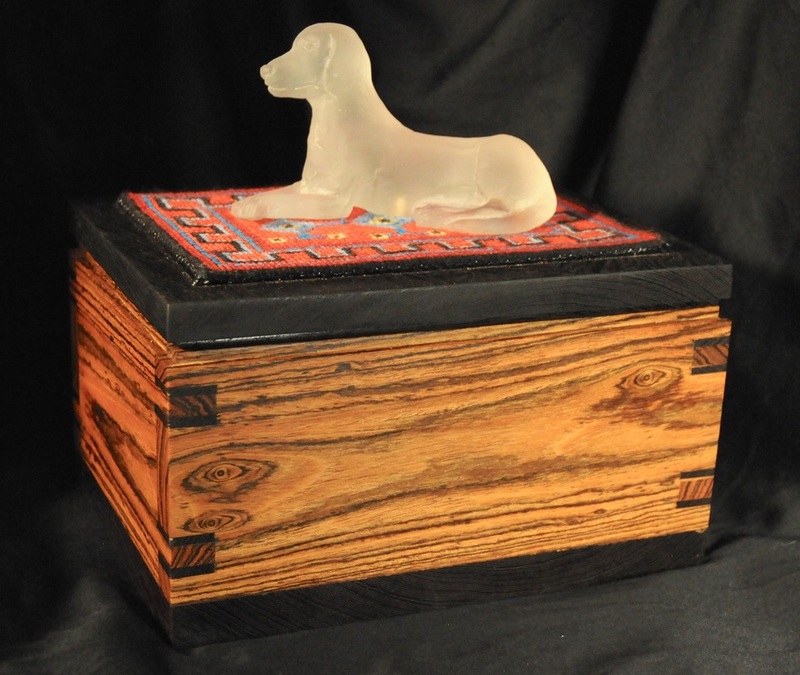 Kiln-cast and sandblasted white glass dog on bocote box with wenge top and base. Dog rests on a needlepoint oriental rug. Size: 8" long, 6" wide, 4" tall, dog is 3" tall. This box is handmade and is one-of-a-kind. The glass dog was made using the lost wax method and was cast in our kiln, and it is entirely unique- no molds were used or made in its creation. We modeled it after our white Labrador Retriever, Lola. It rests on a miniature needlepoint rug (also made by us and entirely original) on a dark wenge wood top. The sides of the box are a beautiful streaky gold and brown bocote wood with gorgeous wenge key joinery, and the base is wenge wood. The inside base is covered with shiny black epoxy, so the box is stunning on the inside, too. Entirely handmade by us in our Austin, TX wood and glass studio (although I did needlepoint the rug while binge-watching Game of Thrones at home!). The glass dog, the wooden box, and the needlepoint rug were all made by us, without patterns or molds, and are entirely unique. 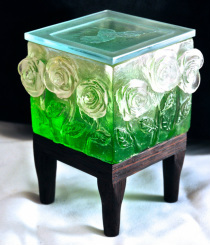 Green cast glass hand-detailed box fixed on lacewood base with metal feet. Lacewood top with etched and carved glass head. Size: Glass box alone is @ 3 1/4" square. Entire thing is 11" tall. This box is handmade and is one-of-a-kind. The box is a glowing emerald green. It was made in wax and the scales were detailed by hand before being cast in glass by us in our own kiln. The head was etched and carved using our own sandblaster. The lacewood of the top and base mimic the scales of the glass. This is a truly unique and gorgeous little box- it looks beautiful from every angle, and especially beautiful with light on it. It would make a lovely engagement ring box. Entirely handmade by us in our Austin, TX, wood and glass studio. 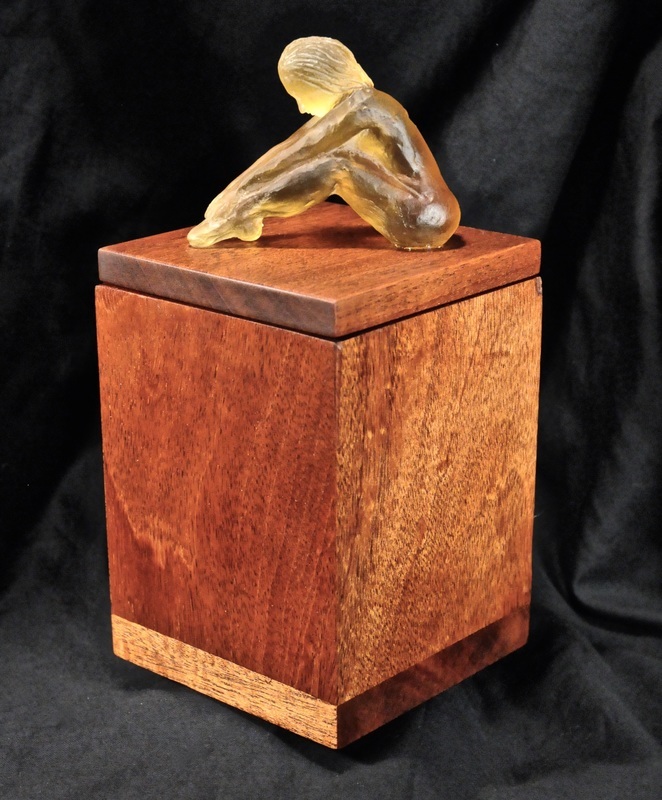 Cast glass figure using the lost wax method on mahogany box. Size: 5" wide and deep, box alone is 7" tall, figure extends 2.5" above the box. This box is handmade and is one-of-a-kind. No reusable molds were used or made of this figure. It is entirely original. The color of the kiln-cast glass is a glowing gold that complements the rich brown mahogany beautifully. This is part of a series of "Gold Girl" boxes which all have different figures on them. This is a lovely and unique piece of sculptural glass art combined with a functional box- it looks beautiful from all angles and in natural or artificial light. Handmade by us in our wood and glass studio in Austin, Texas. Kilncast fuchsia colored glass octopus on a curly maple box lined with suede. This box is handmade and is one-of-a-kind. The octopus was hand-sculpted in wax and then cast in glass- no molds were used or made of this piece. It is entirely original, and looks different (and beautiful) from every angle. The curly maple is of the highest quality, with gorgeous satiny figuring in the wood and a beautiful silky finish. The box is lined in the base with paisley suede in a pink, grey, and amber pattern which echoes the colors of the wood and the glass. This is a breathtaking, unique piece of art which also happens to be a functional box! Size: Boxes alone are 3" square, legs are 2-3" tall. These boxes are handmade and one-of-a-kind. The rose box was cast of a shift-tint glass that appears sea-green in indoor light and a soft lavender-blue in natural light, and it shimmers between these colors depending on the light. The water lily box was cast of swirled blue, purple, and green glass for a watery look. Each box was sandblasted to give it a soft finish. The tops are maple with a pink glass rose or a purple glass water lily set into them, and leaves were woodburned and painted around them. The bases were constructed of maple, built so that light comes in through the bottoms to highlight the glass box. Both boxes and flowers were made using the lost wax method and cast in our kiln. These boxes are part of a series of flower boxes that are much less expensive than most of our cast glass boxes- because the glass boxes themselves are undecorated, and were sandblasted instead of coldworked and polished, it took many hours off our labor time, but still looks beautiful. A wood top instead of glass also cuts down on labor and material costs greatly. 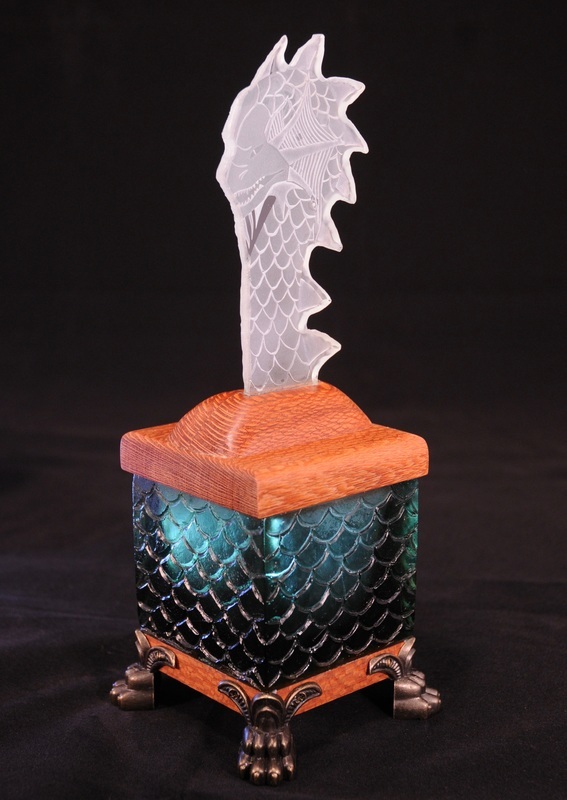 Black-lacquered box (inside and out), with kiln-cast glass blue glass mermaid using the lost wax method. Blue suede lining on base. Size: Box alone is 8" long, 5" wide, 6" tall. Mermaid rises 3" above lid. _This box is handmade and is one-of-a-kind. The mermaid was hand-sculpted in wax before being cast in glass, and she is one-of-a-kind (no reusable molds were used or made of this figure). She sits on a black-lacquered wood box (shiny black inside and out), so it appears that she is rising out of dark night waters. Her reflection in the black top is just outrageously pretty. The soft blue suede on the inside goes gorgeously with the reflective black of the box. This box was handmade of solid maple, and each side (inside and out) was individually painted with reflective black epoxy lacquer, each side taking a day to dry. The mermaid was cast using the lost wax method in a glass kiln (she fired for 3 days!) in a beautiful soft indigo blue glass. This is truly a unique, breathtaking work of art that looks gorgeous from every angle. This box shows EVERY fingerprint like crazy- the black surface is so shiny that even a gentle touch leaves a visible fingerprint. It IS easily cleaned with a damp rag or glass cleaner. Kiln-cast glass box and lid (using the lost wax method ) in several colors of purple blended together. Base is handcarved walnut. Size: Box alone is 3" square (buts weighs nearly a kilo). Base extends 2" above and below box. This box is handmade and is one-of-a-kind. The different purple colors of the box and lid blend beautifully, and the faces are highly detailed. The legs of the box were handcarved out of walnut and have a soft, satiny finish. This is a strikingly unique piece of art that looks beautiful in any light. The glass box was cast all as one piece- no glue is used to keep the faces attached. Kiln-cast emerald colored glass using the lost wax technique, sapele base and top frame. Legs are handcarved. Size: box alone is @ 3.5" square. The base is about 3" tall, and the lid is @ 2" tall. This box is handmade and is one-of-a-kind. No molds were used for these snakes- each one was handsculpted and hand detailed! The amount of detail on this is breathtaking. The detailing of the scales on all the snakes took about 25 hours in the wax model. The glass is a gorgeous emerald color that sparkles in indoor and natural light. The handcarved sapele legs on the wooden base are snaky in shape as well, and the single glass snake on the box top has gorgeous realistic detail. Every cast glass box we make is a labor of love that takes days- first in wax, then in plaster, firing for 3 full days in the kiln, followed by hours of careful coldworking and woodwork to complement the glass. Kiln-cast glass box and top using the lost wax technique with glass hand cast into top. Glass is a shift tint, meaning it changes color depending on the light: it is a soft blue indoors and a lavender-purple outdoors. It shifts between these colors depending on amount of natural and artificial light. Highly polished box. Lacewood and walnut base. Size: Box alone is @ 3.5" square. Hand rises @ 2" above and base is @ 2.5 " high. This box is handmade and is one-of-a-kind. The hand is highly detailed and realistic. The glass is a gorgeous shift-tint, changing from blue to lavender depending on the amount of natural vs. artificial light. The base is lacewood with a beautiful small grain attached to a walnut square, and the box appears to float above the base. This is a truly beautiful unique piece of home decor- and due to its simplicity is one of our least expensive cast glass pieces! Every cast glass piece we make is a labor of love that takes days: first in wax, then in plaster, firing 3 full days in a glass iln, followed by hours of careful coldwork and construction of a wooden base. 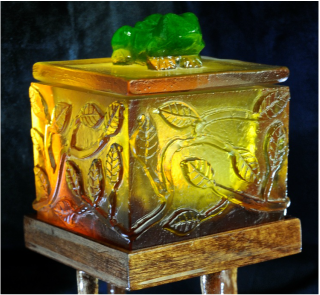 Kiln-cast rhubarb shift tint (appears green in indoor light and amber-orange in natural light) glass box and top with green pate de verre frog cast into the top. Leaf detailing cast into sides. Set into a base of sapele and lacquered jarrah wood. Size: box alone is 3.5" square. Base is @ 3" tall, frog extends up @1"
This box is handmade and is one-of-a-kind. The gorgeous shift-tint glass flickers between orange and green depending on the light. The jarrah wood (from Australia) base is in the shape of a pond, or lilypad to accent the natural theme of the frog and the leaves on the sides. The box was cast all in one piece using the lost wax method, and the top was also cast in one piece using lost wax. There is no glue holding any of the glass pieces together. This is a stunning, unique work of art that looks beautiful in any light, or with a battery-powered tea candle in it. The glass alone weighs about a kilo. Every cast glass box we make is a labor of love that takes days to make- sculpted in wax, cast in plaster, and fired for 3 full days in the kiln, followed by hours of careful coldworking. The box is detachable from the base. Ribbon Mahogany with kiln-cast figure using lost wax method and sandblasted. This box is handmade and is one-of-a-kind. 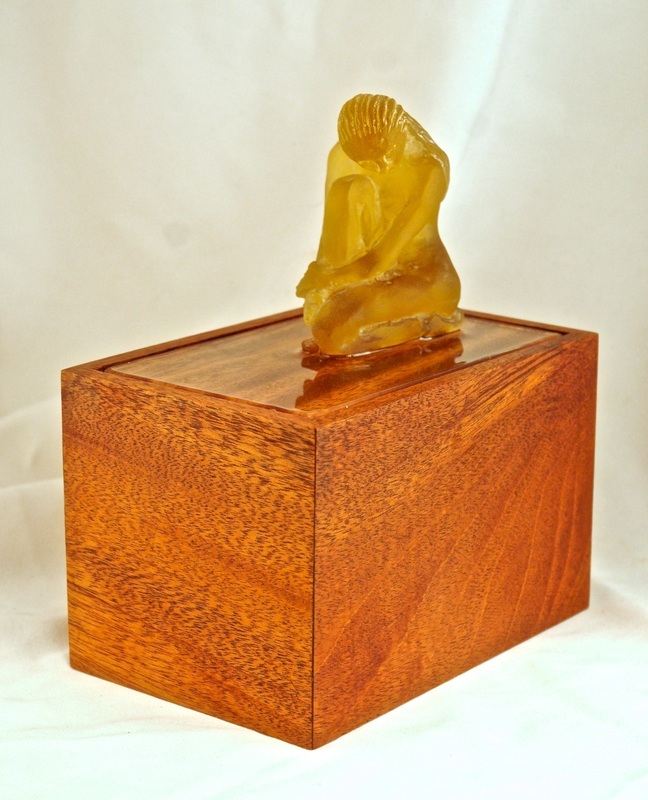 The cast glass figure looks pensive sitting on top of the gorgeous mahogany, which is lacquered on the lid to give contrast between the lid and the smooth finished sides. This is a breathtaking, original work of art as well as a functional box. Both the beautiful wood and the figure are lovely from all sides, making it a perfect centerpiece. Every glass piece we make is unique and takes days days to make- sculpting in wax, casting in plaster, and firing for 3 full days in a glass kiln. Size: Box alone is @3.5" square, base is about 3" tall. This box is handmade and is one-of-a-kind. 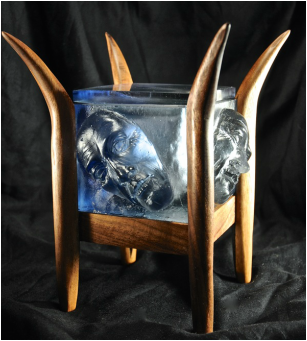 The glass box and lid were kiln-cast using the lost wax method. The glass is a shift tint, appearing green in indoor light and lavender blue in natural light. Putting it in the window yields both colors depending on where you stand. This box was inspired by our love of tales of giant cephalopods from the deep taking unsuspecting ships. The glass alone weighs nearly a kilo. Every cast glass box we make takes days to create- by hand in wax, then in plaster, and takes 3 full days to fire in the kiln. These are painstaking works of art. 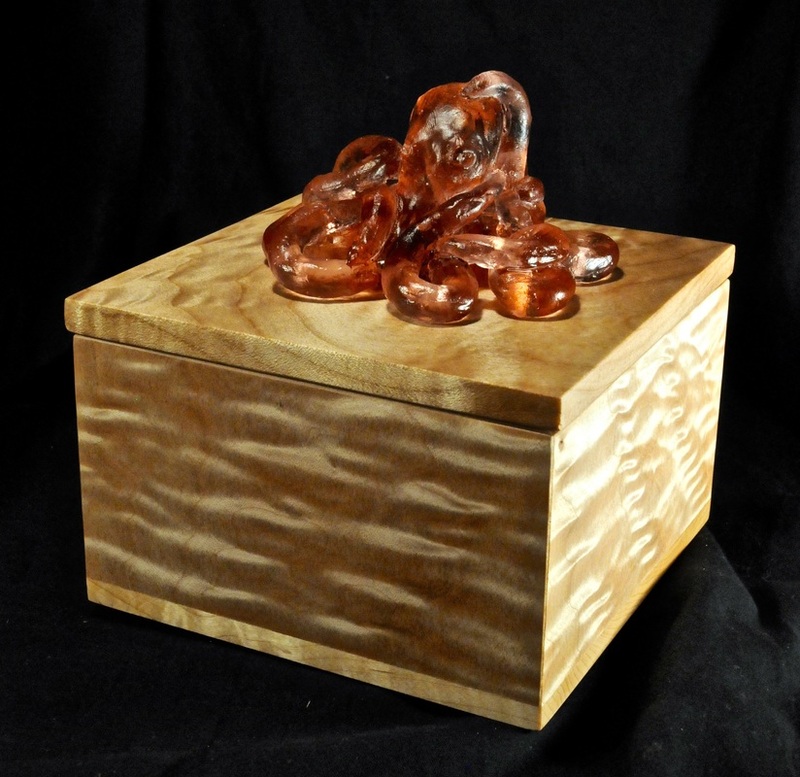 Sapele box and top, kiln-cast glass figure using lost wax method. This box is handmade and is one-of-a-kind. It is an homage to Daum crystal. The sculpting of the figure in wax took several days, and she is cast in one piece in a beautiful, amber-gold glass. She is an integral part of the box lid. The sapele wood is beautifully grained, polished soft and smooth. Every cast glass box we make takes days to create- by hand in wax, then in plaster, and takes 3 full days to fire in the kiln. These are painstaking works of art. Size: box alone is 3.5" square. This box is handmade and one-of-a-kind. Each rose, leaf, and stem was handmade in wax before being cast in plaster- hours upon hours of painstaking work. The pink and green glass flow together beautifully and glow in sunlight. The fused glass top has a slightly bluish cast to suggest sky over the roses. It has a delicate etched glass hummingbird with dichroic extract of several colors in the etch, so the hummingbird subtly echoes the pink and green of the roses and glitters in sunlight. This is a breathtaking and totally unique piece of art. 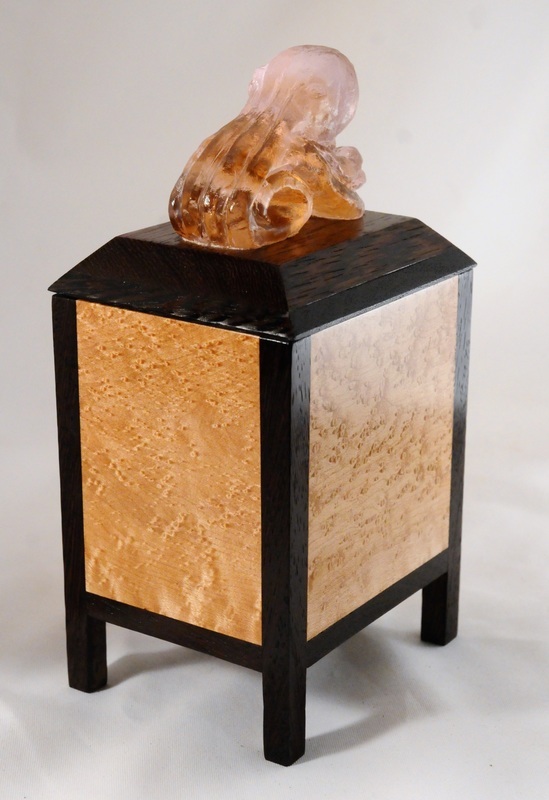 The carved wenge base allows light up under the glass box. Every cast glass box we make is a labor of love, taking days to sculpt in wax, model in plaster, and 3 full days to fire in a glass kiln, followed by hours of careful coldworking on the glass. Kiln Cast glass box and lid using lost wax method, walnut base. Box sits on base and is not attached to it. Size: box is 3.5" square, legs are @2" tall. This box is handmade and is one-of-a-kind. Every cast glass box we make is completely unique. The color is a gorgeous blue-gray, with a dripping, watery effect on the lid and sides. The shell is a glowing pink cast directly into the lid, not attached by glue. The base is a graceful hand-carved walnut with curving legs to mimic the watery look of the box. Every cast glass box we make takes days to create- by hand in wax, then in plaster, and takes 3 full days to fire in the kiln. These are painstaking works of art. Size: Box is 3.5" square, base extends 2" below, lid extends 2" above. This box is handmade and is one-of-a-kind. The glass is a beautiful gray blue and is very shiny. The top has clear/white art-deco swan cast directly into it, not attached by glue. 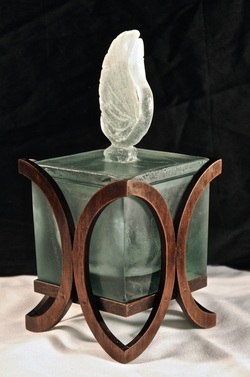 The art deco walnut base is a work of art by itself, echoing the curve of the swan. Every cast glass box we make takes days to create- by hand in wax, then in plaster, and takes 3 full days to fire in the kiln. These are painstaking works of art.